Sir Alex Ferguson believes Manchester United have a "magnificent chance" of reaching the Champions League final after a dramatic win against AC Milan. Wayne Rooney's late strike gave United a 3-2 semi-final first leg victory as they came from behind at Old Trafford. 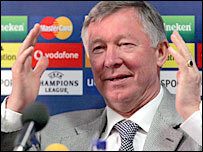 "We kept playing our football, some of which was fantastic, and dominated the second half," said Ferguson. "Some of the football we played was absolute quality, really top class. We've got a magnificent chance now." Paul Scholes is brilliant. He is a joy to play with, a genius. Cristiano Ronaldo's header gave United an early lead, but Kaka's two goals put Milan in front before Rooney's double strike gave Ferguson's side a slender, but potentially crucial, lead. Ferguson added: "We're in front and they know that - it's a really big game now. "They have got a really difficult game on their hands now. We are chasing the Premiership and this is the biggest boost we could have got. "Scholes' pass for Rooney's equaliser was fantastic, just a little flick but what a pass." Rooney paid tribute to the "genius" of Scholes in setting up the first of his two goals. He said: "I see him do it every day in training. He's brilliant. He is a joy to play with, a genius. "It's a great feeling. It was a difficult match but when it got late we kept going. We knew the victory would make it a little bit easier for the away leg. "And to get a goal in the last minute is a great feeling. "It was fantastic. At 2-1 behind at half-time against a very good Milan team, we knew it would be difficult to get the win. The manager told us to keep pushing, keep going and we'll get the goals, and we did."